Break into a fire ant mound and you may see the white brood, larvae and pupae, and lots of angry ants. There are three main ways to control fire ants: granular baits, mound treatments, and broadcast insecticide treatments. When used properly, granular baits will usually give around 80% control. This means you will only have about 1/5 as many mounds as you would if you did not treat. But what do you do about those remaining mounds? This is where the other two control methods come in. Use individual mound treatments and/or broadcast insecticide treatments in combination with granular baits and you can keep your lawn nearly free of fire ants. But won’t they just keep coming back? Sure they will. Fire ants are persistent. The key to successful long-term fire ant control is to be as persistent as the ants. Check out the section on fire ant biology and you will see why fire ant control has to be an ongoing effort. Even if you kill every fire ant in your yard, new queens will soon be landing after their mating flights and starting new colonies. But if you treat preventively, you can keep most of these new colonies from surviving to become big mounds. Fire ant baits are granular products that contain some type of food that is attractive to fire ants and very small amounts of slow-acting insecticides or insect growth regulators. Baits have a lot of advantages. They are inexpensive, easy to apply, safe to pets and wildlife, and they work! The only negative about baits is they are slow-acting. Depending on which bait you use, it takes from one to eight weeks to see the benefit of a fire ant bait treatment. 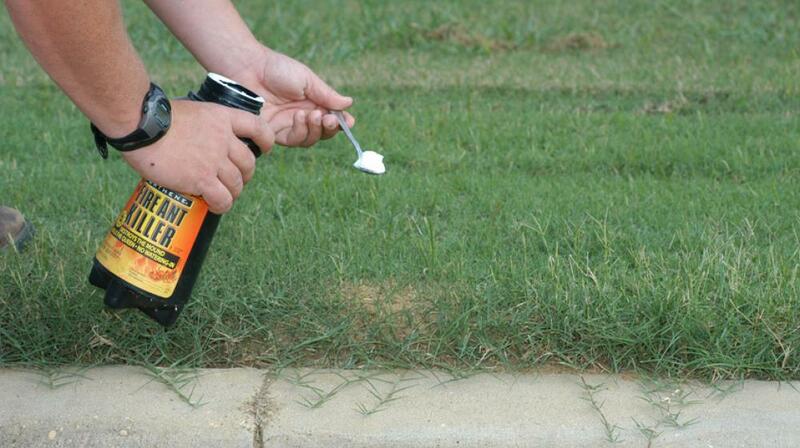 Use a small hand-powered spreader to spread fire ant bait over home lawns. Fire ant baits are designed to work slowly; this is one of the keys to their success. Adult fire ants can’t swallow solid food. They have to carry the bait granules back to the mound and feed them to their young. The larvae convert this solid food into liquid, which is then spread from ant to ant throughout the colony. The slow-acting insecticides and growth disruptors used in fire ant baits get spread throughout the colony before they start killing ants. If granular baits contained quick-killing contact insecticides, they would kill the foraging workers before they were able to carry the granule back to the mound. Because they are slow-acting, baits are best used as preventive treatments. If you don’t want to have large fire ant mounds in your yard, you have to treat before you have large fire ant mounds in your yard. The goal with baits is to eliminate small colonies that are just getting started before they grow large enough to be noticed. In rural areas where fire ant numbers are high, this can mean treating as many as three to four times per year. In more urban areas, one or two bait treatments per year may be enough. Use the holidays, Easter, Independence Day, and Labor Day, to help remind you when it is time to apply fire ant bait. Don’t under estimate the value of that fall treatment. You may not see much benefit before winter, but you will have a lot fewer mounds next spring. Some baits work faster than others, but the slower-acting baits tend to provide longer control. Baits that contain slow-acting insecticides that kill adult fire ants usually give maximum control within a few weeks. Baits that contain insect growth regulators that interfere with the development of eggs and/or immature ants may take two months or longer to reach their peak level of control. There are a few baits that contain both types of active ingredients. Advion Fire Ant Bait (Indoxacarb) is one of the faster acting granular fire ant baits and can provide control in as little as one week or less. 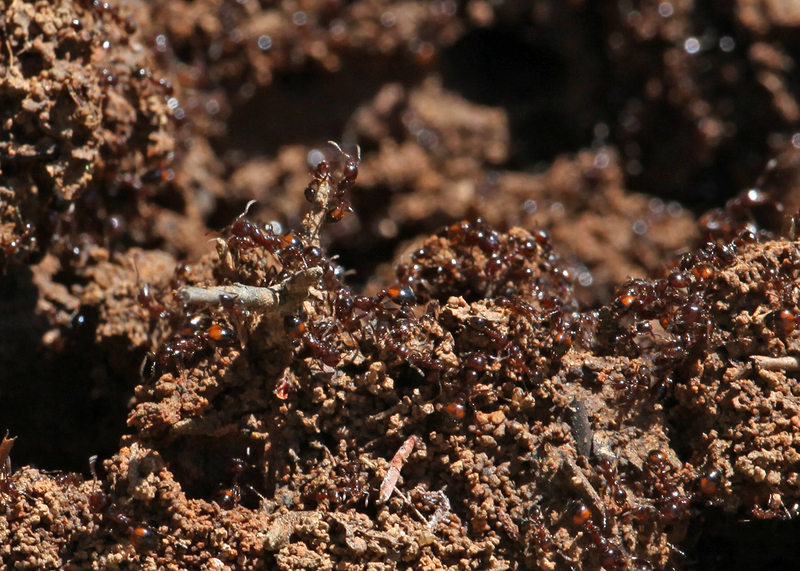 Figure 3 shows a mound with no active fire ants seven days after an indoxacarb based granular fire ant bait was applied to the area. Note that chambers on the right side of the photo that contain fire ant bait granules. This shows that the ants collected the granules and brought them back to the mound, but were then quickly controlled by the treatment, leaving an empty, unpopulated mound. Although they are not necessarily more effective than other granular fire ant bait treatments over the long term, indoxacarb based fire ant baits can be especially useful for situations where there is a need to quickly establish control of heavy fire ant infestations. When purchasing granular fire ant baits be sure to get products that are labeled specifically for fire ants. There are other granular indoxacarb based baits that are formulated for control of other species of insects and ants, and these are not as attractive and effective on fire ants. Most fire ant baits are applied at very low rates, around one to two pounds per acre. That’s less than ½ ounce per 1000 square feet or about 1 teaspoon per 10 sq. ft. Don’t try to use a lawn fertilizer spreader to apply fire ant bait; it will put out way too much! Use a hand spreader designed for applying fire ant baits. Figure 3. A fire ant ghost town! This mound was completely controlled only one week after an application of Advion Fire Ant Bait. Notice the bait granules stored in galleries on the right side of the mound. See Extension Publication 2429: Control Fire Ants in Your Yard for recommended fire ant baits. Mound treatments are dry or liquid drench treatments containing fast-acting contact insecticides that you apply directly to individual fire ant mounds.They kill quickly and are the fastest way to eliminate big, troublesome mounds that are just ‘in the wrong place’. Mound treatments are also a convenient way to deal with mounds that ‘pop up’ between bait treatments. But you can only apply mound treatments to mounds you can see, and for every visible mound there are usually many smaller colonies that are just getting started. Kill all the large mounds and these smaller colonies will soon grow larger. This is where the baits pay off. Baits help eliminate the small colonies before they grow into large mounds. If you try to control fire ants by only treating individual mounds, you will spend a lot of time treating mounds. Dry mound treatments are dry powders that are usually marketed specifically to control fire ants. Products used as liquid mound drenches usually are not marketed specifically for fire ant control; they have many other labeled uses as well. 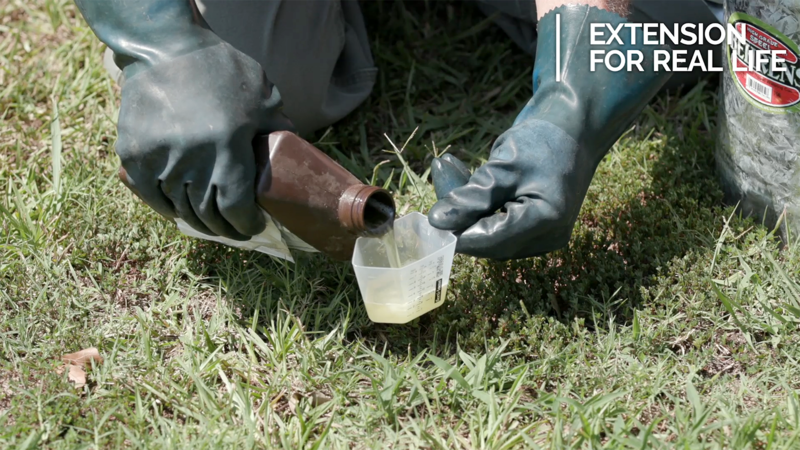 Many insecticides commonly used by homeowners have label directions on how to use the product as a liquid drench for fire ants. Directions usually say something like ‘Mix 1 1/2 fl. oz. in 1 gallon of water and apply to mound’. Liquid drenches are the quickest way to kill fire ant mounds. Drench a mound properly with an effective insecticide and all of the ants will be dead within a few hours. But liquid drenches are time consuming to mix and apply. Dry mound treatments are easy and convenient to use, but are less effective and usually take a few days to work. Regardless of which method you use, don’t disturb mounds before treating. If you do, the workers may take the queen or queens to safety, either by moving them deep into the mound or by moving them out one of their underground tunnels to establish satellite mounds. Use a watering can to mix and apply liquid drenches. Just read the label, mix the specified amount of insecticide in water, and pour over the mound. The key to success with liquid drenches is to use enough liquid to thoroughly soak the mound. Depending on the size of the mound, this ranges from one to two gallons. Begin by applying about ¼ of the total volume to a 10 to 12 inch band around the outside of the mound. This prevents the queen from escaping through the underground foraging tunnels and improves control of workers.Then apply the rest of the drench directly to the mound. Failure to use enough drench to thoroughly soak the mound is the main reason for unsuccessful mound drenching efforts. “That stuff didn’t work! They just moved over and started a new mound. ”Use enough drench to soak the mound properly and there won’t be any ants left to move over. Dry mound treatments may not work as fast as drenches, but they are convenient and provide a quick easy way to treat mounds you spot while mowing the lawn or working in the flower bed. Sprinkle the specified amount of powder over and around the mound and be patient. It can take a few days for a dry mound treatment to work and sometimes some of the ants do survive. This is more likely to happen when the powder is not distributed uniformly over the mound. One obvious disadvantage of dry mound treatments is that they are unsightly, and there are situations where it is undesirable to leave insecticide exposed in the lawn. Dry mound treatments containing acephate as the active ingredient are the most effective, but acephate smells bad, and the odor can linger in the treated area for weeks. Because of this, some people prefer to use dry mound treatments that contain active ingredients like deltamethrin or cyfluthrin. They aren’t quite as effective as acephate, but they don’t have the odor either. See Publication 2429: Control Fire Ants in Your Yard for recommended mound treatments. The broadcast insecticide treatments most commonly used by homeowners to control fire ants are granular products, but don’t confuse them with baits. They do not contain food or attractant and the ants do not collect the granules and carry them back to the mound. These products contain long-lasting contact insecticides and work by killing ants that contact treated soil. Use an appropriate spreader to broadcast the granules over the area you want to protect, being sure to read the label and apply the appropriate rate. Rates for broadcast insecticide treatments are usually much higher than the rates for baits, and many can be applied with lawn fertilizer spreaders. Most products list appropriate spreaders and settings on the label. Foraging workers will be controlled when they contact the treated soil, as will young queens trying to colonize the area. Most broadcast insecticide treatments will control fire ants for four to eight weeks, but some products promise longer control. Some of the longest lasting fire ant treatments are broadcast granular insecticides that contain the active ingredient fipronil (Top Choice is one example.) Because of restrictions on their use near aquatic habitats, these treatments are not directly available to homeowners, but they may be applied by properly licensed commercial applicators, and a single application can provide season long fire ant control. 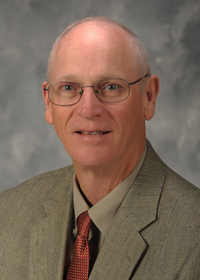 Although costly, granular fipronil treatments are highly effective and can be a good choice for situations where the tolerance for fire ants is extremely low. 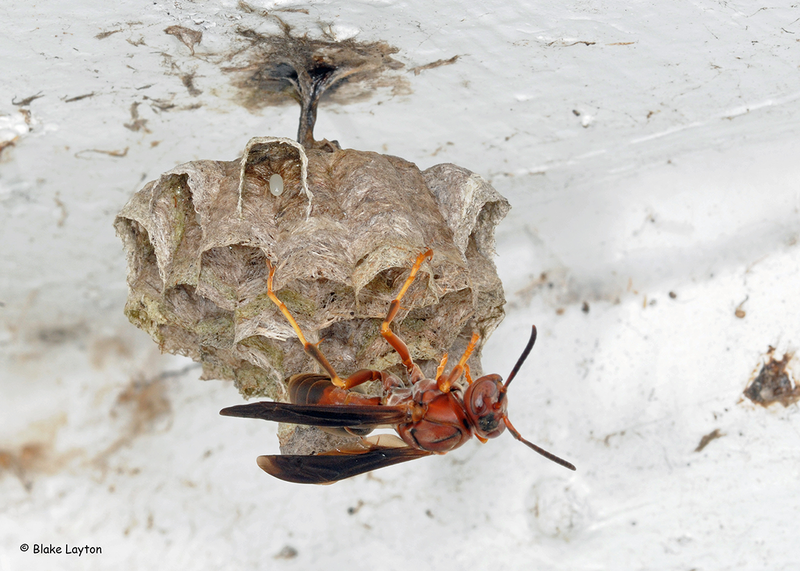 Homeowners who prefer to treat themselves can use granular products containing bifenthrin, gamma-cyhalothrin, cyfluthrin, or permethrin, with some of these treatments providing four to six months of control. Broadcast fire ant treatments can also be applied as liquid sprays using products containing active ingredients such as bifenthrin, cyfluthrin, gamma-cyhalothrin or permethrin. See Publication 2429, Control Fire Ants in Your Yard, for a list of specific products and rates for broadcast fire ant treatments. Because these products can be somewhat costly, many homeowners use them only on the more sensitive areas of their property, places where they really don’t want to have any fire ant mounds, and use baits on the rest of the lawn.This would include places such as the area immediately around a patio or deck, pet yards or play yards, around clothes lines, and similar sensitive sites. Go ahead and also apply baits to these areas when you apply them to the rest of the lawn and you should not have many fire ants in the area. Use individual mound treatments to eliminate any mounds that do appear. By combining all three approaches you will get as close as possible to complete, season-long fire ant control. See Publication 2429: Control Fire Ants in Your Yard for recommended broadcast insecticide treatments.